This booklet was published in March 1989 - some of the information is out of date and an update is planned at the end of the final chapter. Copyright remains with Michael Roberts & fishinginuk.co.uk. You are welcome to print & view this for your own private use. Newcomers to Loch Awe have difficulty finding the best places and using the best techniques on such an expanse of water. After all, the loch has an area of 9,505 acres! This book is written specifically for the angler who does not know the loch and who may not be familiar with some of our local techniques. I have often felt saddened at the sight of a luckless angler coming off the loch, shrugging his shoulders and saying there were no fish to be caught when other have had plenty of success on the same day. Very often the reason for the hapless angler's blank day is lack of knowledge this booklet provides. There is never any shortage of free advice after you have had such a day and there are plenty of experts who will tell you what you should have done just as you are about to head home! This booklet is an attempt to help you before you begin fishing. Some methods of fishing have been deliberately omitted because, although they may be widely used, they are of dubious ethical merit or they may be too complicated to be of practical use. All anglers have their own favourite fly patterns and spinners and I am no exception. I plead the cause of brevity for any omissions in this area. I hope that this brief introduction to the loch helps the reader find success when fishing on such an excellent water. The depths have changed since the erection of the barrage at the Pass of Brander when the loch became part of a hydro-electric scheme. More than half of the loch is less than 100 feet deep and there are plenty of shallow expanses. This is undoubtedly one of the factors which accounts for the quantity and quality of trout present. A more detailed account of fishing areas and places to visit is given later in the booklet. Proposals for a protection order have been on the table for some time. If such an order is granted, a number of new regulations will come into force and anglers should ensure that they are familiar with these if and when they come into effect. Brown trout season: March 15 - October 6. Salmon & Sea trout: February 11 - October 15. In the interests of conservation, any brown trout less than nine inches should be returned. There is no close season for pike. Written permission is required for salmon and sea trout and this permission can only be given by proprietors or establishments who have such rights to confer on visitors. Beware of a boat which may be trolling . The boat may have 40 or 50 yards of line trailing behind. Shore anglers should similarly be given a wide berth. 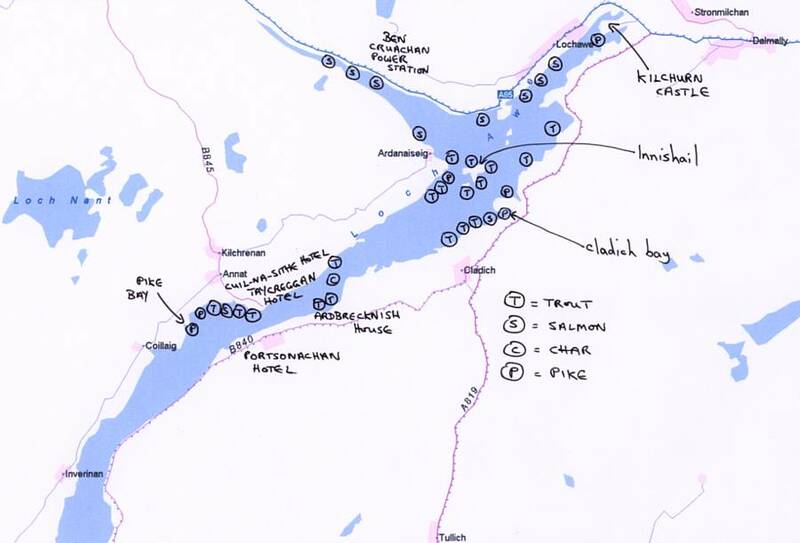 It is hardly surprising that such a large area of water holds not only a considerable number of trout - the species for which the loch is famous - but also a good variety of other species worth fishing for. The loch hold the following quarry fish: salmon , brown trout, rainbow trout (escapees from fish farms), sea trout, char, pike and perch. Loch Awe has produced plenty of mammoth fish in the past and will undoubtedly do so in the future. The loch has as good a prospect of producing a record brown or rainbow trout as any of the Scottish waters. A brown trout of 39 lb was caught in 1866 by W. Campbell Muir, who lived at Inistrynich.Unfortunately, the preserved fish was destroyed by fire at Hayfield House some years ago. Never reknowned for its salmon fishing, the loch nevertheless produced two salmon of 56 lb during the 1800s. We always read of great fish which where caught aeons ago , yet large fish are still caught each year. Each month during the season, the whisky company Ballantines sponsors a competition for the heaviest fly-caught fish in Scottish waters. Their records show that out of 72 winning fish in the brown trout category during 1987 and 1988, four came from Loch Awe. The heaviest , caught in July 1988, weighed 7lb. 12 oz. During the same two years in the rainbow trout category, 13 fish were winners out of a possible 72. One of the heaviest weighed 14 1/2 lb and was caught near Ford in May 1988. If this is not enough to encourage you, a splendid rainbow, weighing 17 1/2 lb was caught by Allan Neil in 1986. The most recent large fish was caught in August 1987 on the Bloody Butcher fly by Derek Graham. This monster weighed 21lb 4 oz. Drowning accidents occur every year and Loch Awe is not immune to such tragedy. As a lifeboat man, I have all too often had to deal with the consequences of inadequate precautions taken by those using the water for pleasure or work. Lifejackets are cumbersome but no one has an excuse for not wearing the vest type of bouyancy aid. A lot of people stand up in a boat when fly casting and of course there is great excitement and moving about when a fish is being landed. This is one of the times when someone is most likely to go overboard. I make my plea for you to wear a BOUYANCY AID OR A LIFEJACKET AT ALL TIMES. Clothing is important for safety too. If occupants in a boat become cold and wet they also become inefficient and careless - just the time when accidents could happen. Always take plenty of extra clothing in a plastic bag. During high summer it is extremely easy to get sunstroke and heatstroke even in this part of the world! Some form of head protection and a long-sleeved shirt is important. I always try to take plenty of non-alcoholic drink with me when boar fishing in the Summer. Sunglasses are useful to protect you from the strong glare off the water. Before setting out ensure you have a spare shear pin if your engine uses one, as well as the tools for replacing it, and that you have enough fuel. Watch out for foul weather. If it blows up suddenly, make for the lee side of an island or shoreline. Avoid travelling sideways on large waves. You should not come to harm if you do not hurry, steer nose on to the waves, and if the occupants sit sensibly to balance the boat both fore and aft so that the boat rides the waves. In really rough weather it helps if the occupants sit in the bottom of the boat, so lowering the centre of gravity and the windage . If you do have the misfortune to fall overboard , do not panic! It is better to swim gently to avoid shipping lungfulls of water. Always climb back into the boat at the stern, if possible, using the outboard engine as a step (which your worried companions should have stopped for you). A wet person becomes extremely heavy and the temptation is for the remaining occupants to move to the side and pull you in. This courts disaster. In some conditions if the person overboard cannot climb back in, it may be better to hold onto him and head back for the shore. People often regard trolling as boring and unskillful because the boat rather than those handling the rods is doing the actual fishing. However, the boat handler needs all his concentration and skill to work the likely spots, and because you are travelling along the loch there is plenty of wildlife to see as well as the constantly changing scenery. Up to three rods can be usefully trolled from one boat at a time with only a little chance of getting tangled. If you are new to this form of angling, then begin with two rods and use three only after you have caught a couple of fish. The side rods need to be quite long - preferably 10 to 12 feet. Rods longer than this become unwieldy when trying to net a fish. I prefer to use soft spinning rods which are built as double handed rods. An 11 ft. grilse or sea trout spinning rod is ideal. Make sure the rod has a screw-locking reel seat. The ideal trolling reel is a multiplier because of its smooth drag control and large line capacity. A fixed spool reel is very much a second choice but it is vital the reel has a good drag control. The centre or poker rod can be much shorter if you wish. A rod of six feet is quite adequate. For all trolling, I use a good quality 10 lb. monofilament line. One benefit of trolling is that if you connect with a monster fish you have plenty of room in which to play it. As long as you have enough line on the reel you can afford to allow a large fish to run. Trolling for Brown and Rainbow Trout. You should usually try to make the boat travel as slowly as possible without stalling the outboard engine. Start with one of your side rods and let the line out until the lure is travelling the appropriate distance behind the boat. I always let the side rods' lures work approximately 30 yards behind the boat, but it's a good idea to experiment with distances between 20 and 30 yards. If you are not sure how much line to let out then try stripping line off when on dry land and mark or remember the depth of line left on the spool of the reel. With multiplier reels estimating the distance is easier if your reel has a level wind device which travels across the reel as line is released. Strip off enough line so that the level wind bar makes one pass across the reel and judge how many yards of line you took off. You then have a fairly good idea how much line you are releasing when you count the number of passes the bar makes as you let line out from the boat. As soon as you have released enough line, engage the reel clutch. You have to set the clutch pressure so that when you hook a fish, the tension is hard enough to set the hooks but at the same time soft enough to allow a strong fish to strip off line without breaking it. A method I often use is to hold the rod still for a few moments and then strike quite hard. I set the clutch so that line is just stripped off a little under this extra pressure; the boat is, of course, moving all the time as you are now trolling. Once the first side rod is working, the angler should keep the rod at right angles to the boat and parallel with the water. This ensures that you keep the lures as far apart from one another as possible. Let the other side rod out and finally the poker rod. I always work the poker rod as little as 10 or 15 yards behind the boat. Fish do not appear to be shy of taking a lure quite close to the boat. Always try to release the lures slowly, by letting the line slowly through your hands or against the drag of the reel, as you motor ahead without making any changes in direction. This reduces the chances of the lures becoming tangled from the start. Another reason for releasing the line slowly is to prevent a rapidly sinking lure plummeting to the bottom and promptly hooking itself on to a rock or sunken tree. One further hint: before letting the lure out to its full distance behind the boat, check the lure is working correctly alongside the boat. 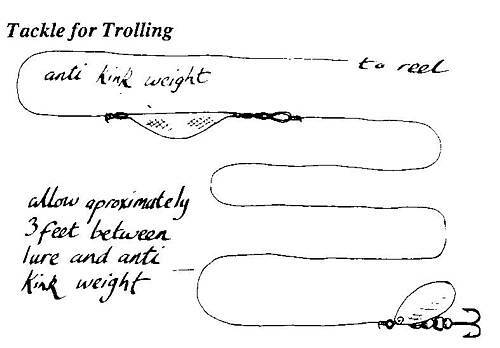 I am sure many anglers troll for hours, blissfully unaware that their lure is upside down or tangled, and all the time curing the paucity of fish. This is also a useful way to check that you are trolling at the correct speed for the desired swimming action of the lure. Now you are trolling! You should troll the bays and shoreline where the water is seven to 20 feet deep. In high summer the middle of the Loch fishes quite well. In both cases, you should vary the direction of the boat quite often. As the boat turns, the lures will swing round some seconds later, causing the outer lure to accelerate and the inner to slow down. This sudden change in pace and direction frequently induces a taking fish to hit the lure. As soon as a fish takes, the rod with the fish on it should be raised and drawn back firmly. Striking the rod back quickly is too violent an action - remember, the boat is still moving, providing additional momentum. The drives the hook home so that your fish should be well hooked. Now hold the rod steady with a firm grip without moving it about until the other rods have been cleared. If it is clear that a large fish is hooked and the rod curves rapidly and ominously towards breaking points, you may ease off the clutch a little so that line is being taken under pressure. As quickly as possible, retrieve the other lures. Resist the temptation to dump these rods just anywhere in the boat. Stow the rods neatly with the lures clipped on to the rod out of harm's way. Now the fun begins! Check there are no boats too near, and check that your boat will not drift onto a hazard when the engine is stopped. If it looks that you would be blown onto a shore then you have to keep motoring until clear. Hopefully, you still have the fish hooked and some 30 yards or so behind the boat. Turn the boat steadily broadside to the wind so that the fish is upwind and kill the engine. As soon as the boat slows down, start winding in line. third, try to prevent the fish coming any closer than a rod length or two to the boat until it is played out - many fish will come quietly towards the boat until they see the angler. Be ready for a sudden surge as you wind in the line. Any time the fish jumps or thrashes on the surface, draw the rod sideways keeping the tip low. Otherwise, keep the rod tip high so that the rod acts as a shock absorber. Be prepared to tighten or ease the reel clutch as required. Never set the clutch too tight - you have plenty of room for even a very heavy fish to be played on light line. Some fish will swim underneath the boat and it is vital you prevent the line from rubbing or catching on the hull. A good trick is to stamp hard on the floorboards when the fish is underneath - this can have a dramatic effect! Once the fish turn on its side , it is ready to be netted. Have a "priest" ready to administer the last rites: not the kind who wears a dog collar - this kind of priest is a stout piece of wood or other material about 9 inches long for knocking the fish on the head. It is wise to use the "priest" before lifting the fish out of the landing net. I remember watching a proud angler admiring his catch on the floor of the boat. The 5lb fish suddenly thrashed with its tail and leapt out of the boat back into the loch! A net with a long handle - about three feet - is vital for boat fishing. Once the fish is played out it will tend to turn on its side. Gently slide the net into the water so that its mouth is under the surface. Move the fish to the net. Swiping or poking the net at the fish is a formula for disaster. 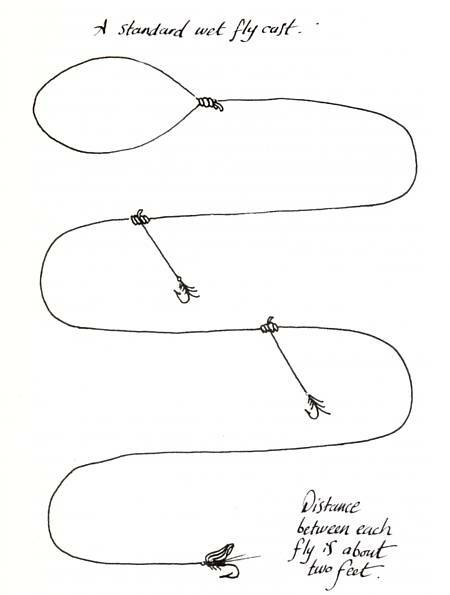 Once the fish is within the mouth of the net, draw the handle towards you. A heavy fish should not be lifted up using the net handle. By pulling the handle towards you the mesh will tend to close over the fish and you can lift fish and net into the boat more safely. During this exercise, it is wise to maintain moderate pressure on the line all the time. This helps to prevent hooks snarling up with the net. It is a good idea to troll with different lures all the time. Even if one lure is being particularly successful on a particular day, I never use more than two lures which are the same. Light and wind conditions and the mood of the fish constantly change and it is always worthwhile trying to anticipate one particular lure "going off' and another coming into favour. Rapala, floating version. Best size: 9cm. Colours: black/gold, blue/silver, black/silver. Fluorescent orange/gold sometimes performs well. Mepps-type lures. Best sizes: from the smallest size (size 0) up to size 2. Colours: silver, gold, black/yellow spot, copper/red spot. The main problem with very small lures is that the hooks are often too soft and can be bent by decent fish. It is essential you use an anti-kink wye lead (1/a, '/z or 3/a oz size) with this spinner. Dexter Wedge. Best size: lOgm and 16gm. Colour: silver. Toby-type lures. Best sizes: l2gm,16gm. Colours: silver, gold, gold/green, copper/brown, blue/silver, black/gold. The word `fly' is rather a misnomer because you usually use `flies' which are of the lure type, representing small fish. This is the most exciting form of trolling. I always troll with at least one fly rod and usually this is the poker rod in the centre. I use a standard trout fly rod and a sinking line to avoid leaving a wake from the line. The line must have a good length of backing (50-60 yards) correctly spliced on to it. A single fly lure is attached to a cast of 8-lOlb nylon which is at least one metre long. Once the side rods are working on the boat, check the fly lure is swimming correctly and then strip line off the fly reel until most of the fly line is out. It is a good idea to check the line is submerged and that the fly is not skating along the surface behind the boat. The reel check should be set fairly stiff and the rod laid down so that it is pointing directly behind the boat. When a fish takes, the rod is not in a position to absorb any impact and line will be stripped off the reel quite easily. There is nothing to beat the sound of a fly reel screaming when a fish takes! Immediately lift the rod and hold it steady until the side rods are cleared and you can then play the fish in the way described above. One of my most memorable days fishing on Loch Awe was a few years ago on a scorching hot July day. I was trolling on my own with two fly rods - one on either side of the boat. Conditions were impossible for brown trout but the rainbows were feeding hard. Every single fish behaved just like sea trout that day - as soon as a fish was hooked it would make a series of spectacular jumps. The fish spent as much time out of the water as in it. I can still recall the reel-sizzling runs and bouts of tail walking. I landed a dozen fish that day - all were over 21b - but I must have lost between 15 and 20. Long shank size 8 hooks are best, in the, following patterns: Jersey Herd, Alexandra, Green Awesome, Fiery Brown Awesome, Squirrel and Orange, Muddler Minnow. Loch Awe is not particularly well known for salmon but every year a few are caught. The main difference between trolling for salmon and trolling for trout is the speed of the boat. The engine should be adjusted so that you are travelling at a brisk walking pace. If you have extra spools for your reels, it is prudent to use stronger line, around the 151b mark, but many folk use their standard trout trolling outfit with a length of 15 lb line for the last metre of line after the swivel. Apart from one or two deep-water areas over which salmon travel, the best places to troll are in quite shallow water. The fish will lie in water which is between four and 12 feet. Toby-type lures. Best size: 18gm. Best colours: copper, cop­per/brown, black/gold (sometimes called tiger or zebra), gold. Rapala. Best size: lOcm and 13cm. Best colours: black/gold, flourescent red/gold, black/silver, blue/silver.Kynoch or Minnex-type lures in the smaller sizes. Mepps-type spinners in the larger sizes - size 2 or 3. I have never caught salmon on the trolled fly but I have no reason to suppose it would not be successful. Most folk trolling for salmon will use toby-type lures because there is always the chance of picking up a trout in the absence of a salmon. This beautiful little fish is well worth catching and there is a considerable population in the loch. Char are deep-water fish but can be caught at between three and 10 feet below the surface from June onwards. The middle stretches of the loch are best, preferably where the bottom shallows up. Normal trout-trolling tackle is used but you should use one, two or three wye leads linked together so that the lure works deeper. I use about 1'/a oz of lead. Do not expect to catch large numbers of char - the best day I had was to catch six (along with brown trout) in one day. The char do not run to a large size, averaging ½ to ¾ lb, but they make delicious eating! Mepps-type lures. Smallest sizes. Best colours: silver, gold. Fly fishing is by the traditional method where the boat drifts slowly downwind while lying sideways to the waves. Use a rod of between 10 and 11 feet. The longer the rod the better - but remember, it has to be light enough for you to cast single handed all day! My own favourite fly rod is a carbon rod of 11½ feet. The rod should have quite a soft action. The reel should be a standard fly reel with room for at least 35 yards of backing. It is a good idea to use a reel which has .its side plate exposed - this means you can use your hand pressing gently against the exposed rim as a brake when a fish makes a powerful run. I tend to use a slow-sinking line for most of the season but many people use a floating line for their wet fly fishing. A fast-sinking line can be useful for the first six weeks of the season and for back-end fishing. Use good quality monofilament for the fly cast; 61b line is about right. A 4 lb line can certainly be used but it is rather light for boistrous fish on a windy day. Use three flies, two flies on short droppers and a tail fly. See diagram below. Cast out enough line, hardly more than twice the length of the rod, so that when you retrieve the cast, the first dropper - the bob fly - skips through the waves towards you. To increase the time the flies stay in the water for each cast, most anglers shoot about a yard or so of line. 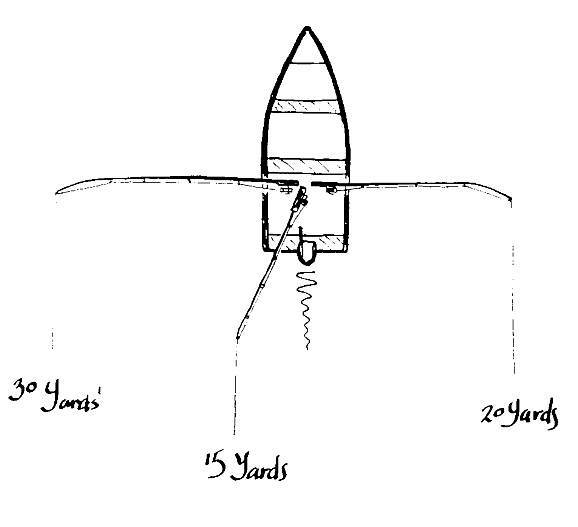 This means that after casting, about a yard of line is slowly drawn in by hand and the rest of the retrieve is finished by continuing to draw the rod upwards to the vertical. False casting and standing up in the boat to try to hurl your flies ever greater distances results only in the fish being scared yet further away from the boat. In all conditions other than a flat calm, fish are surprisingly unalarmed when close to a boat and will enthusiastically snap at your proffered fly even when alongside the hull. The only time it is worth considering casting a greater distance from the boat is on a flat calm day or if you want your flies to swim a bit deeper. Many anglers are unaware that every bump and knock with their feet or tackle scares away fish. The best tactic is to sit quietly in the boat and cast gently. The dry fly is certainly worth trying but because conditions are less likely to be suitable for this form of fishing, I shall not go into greater detail on it. Fishing with a single lure fly also demands casting reasonably far from the boat so that you can allow the lure to sink a little and vary the speed of your retrieve. For lure fishing, use a cast of 61b or 81b monofilament about two metres long. Size 10 and size 12 flies are most popular. If there is a big wave on the water, you should try a size 8 fly on the bob. 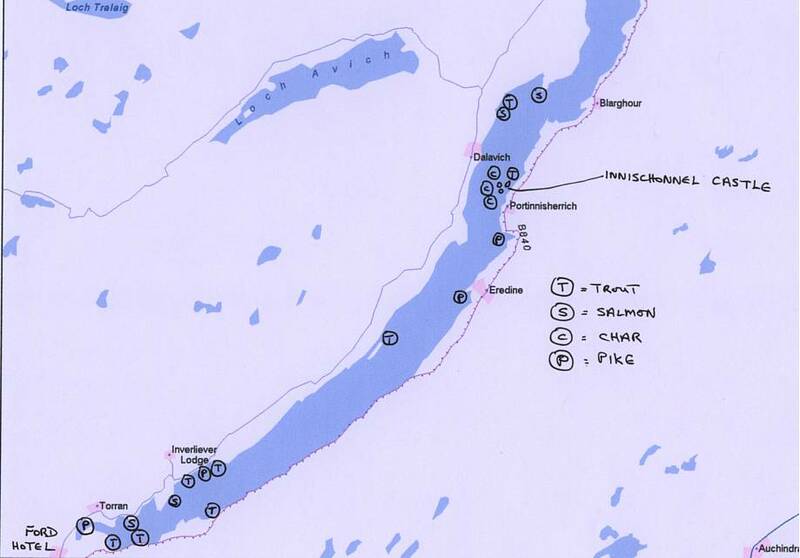 Black Pennel, Grouse and Claret, Kingfisher Butcher - are the best known patterns for Loch Awe. At least one of these patterns should always be on your cast. Peter Ross - an ideal tail fly. Bibio - a good bushy pattern to fish on the bob in a good wave. Invicta - best from July onwards. Sam Slick - similar to the Invicta, best from July on. Greenwell's Glory - a good pattern from late April to June. Macleod's Olive - another green fly like the Greenwells. Bloody Butcher - a good all round fly. March Brown - a super fly useful for the whole season despite its name. Black Zulu - another good fly for the bob. Red Palmer - fishes well from July on. Wickham's Fancy, Ke-He, Black and Peacock - can be good when trout are spider feeding on snails. Green Awesome - good for rainbows and brown trout alike. Fiery Brown Awesome -best for rainbows. Jersey Herd - good for both rainbows and brown trout. Alexandra - good for bright sunny days. Ace of Spades - any black lure is worth a try. Anyone who has not tried dapping has not lived! This is one of the most exciting forms of fishing and because no casting skills are required, it is easy for beginners to try. There is one huge snag, however: although you may see many fish rising to your fly, hooking and landing the fish is more difficult than with most other methods of fishing. You can dap with your ordinary fly rod if it is long enough, but most people prefer to use a rod designed specifically for the purpose. The rod should be between 12 and 17 feet. Telescopic rods are best, to overcome the problem of storing such a long rod in the boat. Your standard fly reel should have plenty of backing and the main line consists of 25 yards or so of dapping floss. The cast consists of a yard or two of 61b or 81b monofilament to which the dapping fly is attached. Many people advocate knotting the floss every few feet or so to prevent the floss catching and fraying on anything it comes into contact with. My advice is not to bother as knotting only impairs the sail-like function of the floss. If the line becomes frayed, chop off the offending piece and continue fishing - you actually use only the last six or seven yards of floss when fishing anyway. The technique works only when there is a reasonable breeze and the weather is warm. The best months for dapping are from June onwards. Strip off a rod length of line and allow the wind to catch the fly and the floss. The fly is blown ahead of the sideways drifting boat in such a way that it bounces enticingly on the waves. You work the dapping fly over the surface of the waves from left to right across the water in front of you. If the wind blows the fly too far ahead, let out more line until you can control the fly, representing an insect struggling to break free of the water. The softer the wind, the shorter your nylon cast, and vice versa: a longer cast for breezier conditions. If it is really windy, use a two-yard cast with a dropper of about five inches. Tie a slim, fairly heavy wet fly size 6 or 8 on the tail and your dapping fly on the dropper. The wet fly acts as an anchor and will also catch fish. When using this method, ignore the wet fly and just work your dapping fly on the dropper as described. When a fish rises to your fly you must not tighten your line too quickly. Count to five and only then tighten into the fish. As you can imagine, timing this pause while the fish turn with the fly is extremely difficult. Some fish will leap clean out of the water without touching the fly, turn under water and pick up the drowned lure. You need nerves of steel to resist the temptation of striking as soon as you see a rise. If two people are fishing, it is a good idea for one to dap and the other to fish with the traditional wet fly method. The sight of a large bushy lure often excites the trout to take the wet fly and the wet fly may help draw fish to the dapping fly. Flies in sizes 6 or 8 tied on low-water salmon hooks are best. Use Black Palmer, Loch Ordie, Black and White Palmer. It is always worth experimenting with different flies. I found a yellow and black fly worked well one day but was hopeless the next. I have tried dapping the artificial and natural daddy longlegs with little success but this does not mean you shouldn't give it a try. Loch Awe has plenty of good-sized pike. The best months are from mid-February to April when the fish move into the shallows for spawning. Spinning with plugs and using a deadbait with or without a float are the most productive methods. Tackle requirements are quite straightforward. You need a reasonably strong spinning rod of seven to eight feet, with a fixed spool reel loaded with 15lb nylon or at least 50lb braided line. Use a wire trace for spinning and on your deadbait cast. There are plenty of different ways of setting up a deadbait rig and the most common is to use a Jardine snap tackle with size 6 or 8 trebles. The head of the bait should be mounted so that it is at the very end of the cast. Small trout make the best deadbait and you can get them from local fish farms - the nearest is near Inveraray. See diagram over page. There are a few "hotspots" for pike on the loch but an often neglected area is the point of any bay. I have found that pike dislike being in the centre of a small bay, except when basking in hot weather, but they frequently lie in ambush at either end in water which is anything from two to 10 feet deep. Pike are often taken when trolling and can certainly put up a respectable fight if the water is reasonably warm. You can sometimes have fun on a warm calm day by trailing a floating plug or rapala 20 yards or so behind the boat. Allow the plug to lie on the surface and then take a couple of strokes with the oars. Allow the boat to drift to a standstill, when the floating lure will be visible popping up to the surface. When everything is stationary, repeat the process. This often induces a pike to smash at the lure as it dives under the surface and can be quite effective in open water away from the shallows. Toby-type lures. Best colours: silver and blue/silver. Rapala, floating type. Dark or bright colours. line. A few years ago, I watched one angler do particularly well along the shore because, unusually, he was wearing chest waders. His stealthy approach and ability to cast his team of small wet flies those extra few yards paid dividends and he enjoyed some good sport for a few hours. A word of warning to the shore-based fly fisherman: beware of sudden drop-offs, particularly at the mouths of burns entering the loch. This hazard can take you by surprise and the bottom of the loch can plummet in the distance between taking one pace and the next. The maps above show some of the best areas for fishing. It is well known that rainbow trout are found in high concentrations near the fish cages on the loch. Some "anglers" spend all day bait fishing near the cages but this can hardly be called sport. If you want to be a fishmonger, it would be just as satisfying to go to a nearby fish shop and buy your trout there. Respect the fish-farm owners' requests not to fish too near the cages. Trolling in the vicinity of the cages can be productive, but you may only catch small shoaling fish here. There are numerous shallow areas which present a hazard to boat owners and you should study any of the many large charts showing the depths. The depth soundings are not accurate but the shallow areas are clearly shown. Many inlets and bays seldom have human visitors. Some small islands do not have safe landing areas and may be too overgrown. If you are visiting any island with a castle or ruins, please respect the area so that others may derive pleasure from their visit. Some visitors seem to have an unnecessary obsession for lighting fires and, to judge by the remains of many fires, it is amazing how many people think beer cans will burn. I always have a quick rubbish collection before leaving an area - removing our own and other people's rubbish will help keep the area beautiful. This island is accessible only by boat. The small landing site is on the side nearest the eastern shore. A huge fireplace is still standing - see how many people can stand within its area. Some of the ramparts still exist, but take care when walking on the ruins. The Forestry Commission has many forestry walks marked out in this area. Leaflets and maps are available from nearby Dalavich village and hotels on the lochside. The Holy Isle or the "Isle of Rest" looks across to Ben Cruachan and is my favourite place to visit. There is a small beach for landing on its northern shore, there are 13th and 15th Century burial grounds and some splendid Celtic cross headstones. Covered with wild daffodils at Easter - reputedly planted by nuns from a Celtic monastery which was on the island - there is an atmosphere of complete peace. This castle is part of one of Scotland's most famous views, photographed for every tourist brochure. The castle is in disrepair and I recommend the site more for its splendid view and the backdrop of Glen Orchy than as a place to visit. I now want to cover some other aspects of fishing on Loch Awe which, though not so easily categorised, will interest the serious angler. Marvellous weather of this kind really does occur quite often in Argyll. It is superb for a sun tan but hopeless for the fly fisherman. I have already described pike fishing with a floating rapala on flat calm days. A tactic which works well for trout is to fish out in the middle of the loch with a Mepps-type spinner. Cast as far as you can and then let the spinner sink for a couple of minutes with the reel allowing line to be freely taken. Wind in the lure in the normal fashion. I have heard of the same technique producing success with a couple of maggots on a hook and one or two lead shots pinched a couple of feet ahead of the hook help the bait sink. The only way to survive scorching days is to keep trolling to where there is a chance of a breeze rippling the surface when you can use the standard wet fly. This piece of high tech equipment can be be extremely useful on a water like this. There are plenty of waterproof portable versions on the market which you can use even on a hire-boat. An echo sounder will not necessarily help you catch more fish, but it does provide you with more information about the depths, and good quality sounders will show up fish and the depth at which they are swimming. Unfortunately, an echo sounder will not tell you which species it is showing and whether they are hungry feeding fish! It is surprising how deep some fish swim. I regularly get echoes down to 50 and 60 feet. I have always suspected these are large brown trout, but this is one of the best aspects of fishing - there is always a bit of mystery. If we knew all the answers about fish and could always catch them easily, there would be little point in fishing. Deep-water trolling with lead core lines or deep-diving plugs is always worth trying if you have suitable tackle. One thing is certain about this method: you can go for hours or even days without catching a fish because you are after scarcer quarry, the large trout. I have had little success with this form of fishing but I have not really spent enough time using it. After trying their regular favourites anglers start to wonder what other fly patterns to use. Spooning a fish and identifying its stomach contents can give some clues to "matching the hatch." If you are trolling and spoon a fish you have caught, make a note of where you caught it. It is surprising how different the fare of fish only half a mile from another can be. I was fishing with a friend one memorable day in May when we noticed swallows were swooping into a nearby bay and feeding on a hatch of flies. We identified the flies as green olives and started to catch fish using Greenwell's Glory and Macleod's Olive patterns. By now the seagulls were joining in the fray. The hatch was so heavy that the fish went into a feeding frenzy, splashing and rolling at the super-abundance of flies. I remember seeing a couple of trout darting between my waders as I waded in the shallows! We soon found we were catching fewer fish until we switched to patterns which contained some orange or ginger - Wickham's Fancy being the best pattern on this sunny day. The moral is clear - colour matching the artificial insect with the natural insect is not always essential and in some cases may be a disadvantage. This phenomenon of "translucency colour" is not new and it is common on other waters that when, for example, the daddylonglegs is being imitated, a green version is more successful than the brown/beige colour of the natural's body. Always keep an open mind when choosing fly patterns and never be afraid to experiment. If demand or interest is sufficient, I would be glad to add any updates relevant to the above text.